I’ve been working away from home just a bit more this last week and with the spring like weather now here, I plan to be on the road a little more often. If it is just a day in the car then I often pack myself a meal in my Bariatric Bento Box but if it’s more than one meal or a prolonged stay then, just like everyone else, I need to hit a cafeteria or buffet style place to fuel up. Fuelling up would be easy if I found a place that had banks of nutritious salads, cold deli meats, a simple grilled/broiled main/entree dish and whole host of vegetables (at a reasonable price and speedy time arrival) but I haven’t found too many mainstream ones as yet. Wouldn’t it be wonderful to see this on the horizon? So how do you navigate the on-road buffet bar, work’s cafeteria or ‘only-place for miles around’ eating stop? Here are some tips and best bets that I have found useful …. Choose wisely at the salad bar. Making the right choices at a salad bar can be a good way to maintain your healthy eating plan. Help yourself to filling, nonstarchy vegetables like broccoli and cauliflower and go easy on the cheese and salad dressing (olive oil and vinegar is a good choice; just remember that 2 tablespoons is the right amount to use for dressing salads). Instead of iceberg lettuce, choose dark leafy greens, such as watercress/arugula, spinach, red leaf or romaine lettuce, and/or mesclun. If you can tolerate them then enjoy a little of the pre-cut fresh-fruit offerings or add a small amount of dried fruit, if available, to your salad. Instead of topping your salad with bacon bits and croutons, sprinkle on some nuts or seeds, like sliced almonds, chopped walnuts or pecans, or pumpkin seeds, for a healthy crunch. You can also add some grilled chicken or steak, tofu cubes, your choice of beans or other legumes, a hard-boiled egg, or some tuna or salmon for a boost of protein. Tossing in a couple of avocado slices (and using less dressing) will add some flavor and good fats and keep you feeling satisfied. Go for healthy soups. Soups are a healthy and filling cafeteria or buffet option for the bariatric when they are made without and with a variety of nutritious ingredients, such as vegetables, lean meats, poultry, or seafood, beans and other legumes, and/or whole grains like quinoa, and barley. Try a black bean soup, or a soup made with broccoli or cauliflower in a beef, chicken, or vegetable broth base. Chilled tomato- or cucumber-based soups, like gazpacho, are also a good option in warmer months. Check out the “made to order” stations. Some cafeterias and buffets offer individual stations that allow you to select the ingredients for your own omelette, pasta dish, or stir-fry. If you want an omelette, your best bet is to fill it with vegetables like peppers, tomatoes, spinach, and/or broccoli. If you want cheese, make sure it’s reduced-fat or ‘mature’ so that you need less to get a great taste. For stir-fries, go for grilled/broiled chicken breast, prawns/shrimp, tofu, bok choy, broccoli, green beans, peppers, and/or mushrooms and make sure the “frying” oil is used sparingly if you can. If you’re ordering pasta, stick to a small 1/2-cup serving of whole-wheat pasta and choose a marinara, pesto, olive oil and garlic, or white wine-based sauce with just enough to coat the pasta but not drown or drench it. Avoid stations serving white pasta, burgers and fries, breaded chicken, and pepperoni pizza. Postpone dessert. 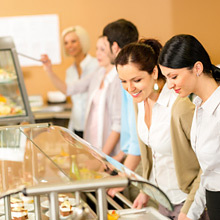 Many of the desserts in cafeterias and buffets are diet and healthy eating regime busters and can be dumping ground territory with their high fat and high sugar offerings.. Rather than choosing a dessert as you pass through the line the first time, wait until the end of your meal to select a sugar-free jelly/gelatin cup or fruit salad or limit yourself to just a bite or two of a decadent dessert (why not share with a friend?). Better yet, avoid temptation and wait until you get home to have a www.bariatriccookery.com ‘Return to Slender’ dessert you’ve prepared yourself. Ask for it if you don’t see it. If you’d like your chicken breast without the creamy sauce or you wish there were broccoli on the salad bar, speak up! Often food managers can accommodate special orders and meet your requests. Likewise if you want your sauce, dressing or topping on the side so that you can add just the right amount yourself then do ask.